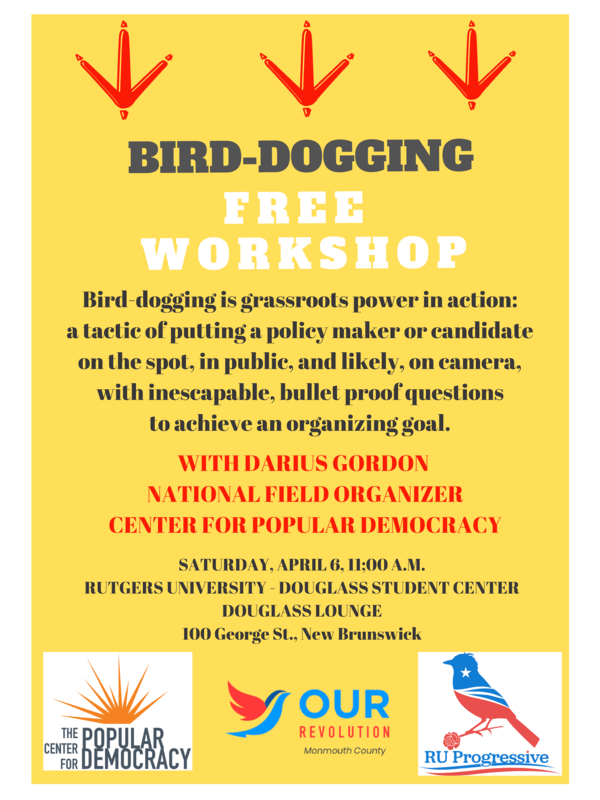 Bird-dogging is how we advance progressive policies! Come learn this effective technique of speaking truth to power and change the conversation on the issues that are important to you. This is a training in direct action that will help in holding elected officials accountable to their constituents. It will enable you to better engage with decision-makers and track the positions of candidates and representatives. The workshop is led by Darius Gordon from the Center for Popular Democracy (CPD). CPD is a high-impact national organization that works to create equity, opportunity and a dynamic democracy in partnership with local base-building groups and progressive unions. CPD organized a broad network of independent activists (the “bird-dog nation”) to take rapid response actions in defense of democratic values and norms all across the country. Location: Douglass Lounge in the Douglass Student Center at Rutgers University. The event is co-sponsored by RU Progressive/Rutgers for Bernie 2020. There will be some snacks!